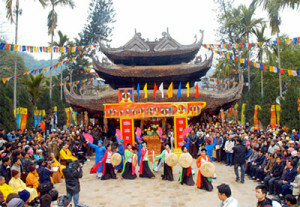 The Huo ng Pagoda Festival officially opened in Hanoi’s My Duc district on February 5 or the sixth day of the lunar New Year, with the attendance of about 50,000 pilgrims. Going to Huong Pagoda is a spiritual journey into Buddhist Land – where the Goddess of Mercy leads a religious life. Sightseeing trips to pagodas, temples and caves are the main attractions at the Huong pagoda festival, in addition to ceremonies to ask favours from Lord Buddha. Built in the late 17th century, Huong Pagoda has a large number of pagodas, temples and caverns filled with marvelous stalactites and stalagmites, about 60km from downtown Hanoi. The organising board estimated that about 180,000 tourists have flocked to Huong Pagoda over the past four days. The same day, at the Soc Son Temple Relic Site in Hanoi ’s Soc Son district, the Giong Festival also took place to commemorate Saint Giong, who legend says turned from a child to a giant overnight to fight against invaders in the past. In Me Linh district of the capital city, Vice President Nguyen Thi Doan attended a ceremony to mark the 1,974 anniversary of Trung Sisters’ Uprising and open the Trung Sisters’ Temple Festival 2014.